1.6 Why You Should Read This Report? 2.1 What are the stages of Offshore Oil & Gas Decommissioning? 3. Global Offshore Oil & Gas Decommissioning Market: What are the Global Market Dynamics? 3.2 Drivers: What are the Factors Promoting the Growth in the Offshore Oil & Gas Decommissioning Market? 6.2.4 What is the Structure of the Gulf of Mexico Offshore Oil and Gas Decommissioning Market? 6.2.5 What are the Market Dynamics of the Gulf of Mexico Offshore Oil and Gas Decommissioning Market? 6.2.5.2 How Strong Regulations have had a Role to Play in the Growth of the Offshore Decommissioning Market in the Gulf of Mexico? 6.2.5.5 Has Experience and Skills Led to Market Growth in the Gulf of Mexico? 6.2.5.8 Permitting Process – Has this Prolonged the Offshore Decommissioning Procedure? 6.2.6 What is the Scenario of Offshore Oil & Gas Decommissioning in Gulf of Mexico and North America Market by Type? 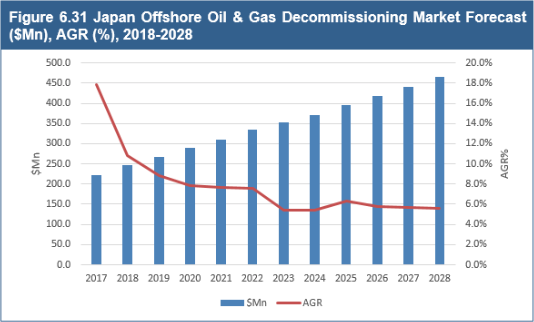 6.2.7 Which is the Largest Market among the Gulf of Mexico and North America Offshore Oil & Gas Decommissioning Market 2019-2029? 6.3.4 What is the Scenario of Offshore Oil & Gas Decommissioning in the North Sea Market by Type? 6.3.5 Which is the Largest Market among the North Sea Offshore Oil & Gas Decommissioning Market 2019-2029? 6.4.2 What are the Dynamics in Asia-Pacific’s Offshore Oil & Gas Decommissioning Market? 6.4.2.2 What are the Decommissioning Conditions in Asia-Pacific? 6.4.2.5 Deepwater Development and Increasing Production – an Obstruction to Offshore Decommissioning? 6.4.3 What is the Scenario of Offshore Oil & Gas Decommissioning in the Asia-Pacific Market by Type? 6.4.4 Which is the Largest Market among the Asia-Pacific Offshore Oil & Gas Decommissioning Market? 6.5.1 What is the Scenario of Offshore Oil & Gas Decommissioning in the RoW market by Type? 6.5.2 Which is the Largest Market among the RoW Offshore Oil & Gas Decommissioning Market? 8.3.3 Eric Faulds Associates, Ltd.
8.3.4 Genesis Oil and Gas Consultants Ltd. Figure 2.1 Stages in Offshore Oil and Gas Decommissioning?